My recent switch to SQLite for this blog prompted for a way of editing the database using a graphical user interface from time to time. This post is really a result of the difficulty I had of finding such a tool that is reliable, easy, and free. Just google for “free SQLite Editor” or “free SQLite GUI”, and I’ve tried quite a few of the sharewares and freewares listed there, and they still fall short of being mediocre. I hope this helps anyone looking for something like this. 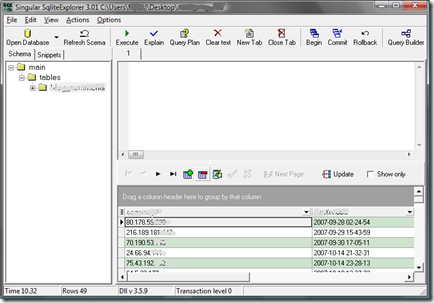 SQliteExplorer is a not-so-well-known SQLite database editor that I found about two years ago. I’ve been using it until earlier this year when I had to do a quick reinstall of Vista. I did what anyone would do if a name of a program slips from memory, and googled it. That didn’t work. Well, it took quite a while of digging in my bookmarks to find this gem again. Of all the SQLite tools I’ve used, this is the quickest, simplest, and most stable. It has yet to give me an error while editing databases. It should just be an executable (exe) named sqlite3Explorer.exe. Remember to download the latest SQLite DLL (sqlite3.dll) from the SQLite website. It needs to be extracted where the program is located to work.